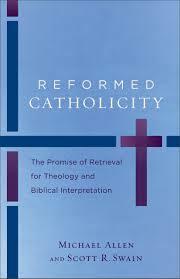 The theological hills are alive with the sound of “retrieval”–the idea that theology can only go forward if it begins by looking backward to the tradition that maintained and fed the faith that came before it. Whether it’s looking back to the Fathers, or Thomas, or the early Reformed tradition, across the denomination divides, theologians are increasingly explicit about their necessary dependence on the theology of their forebears, whether in the Creed, Counsels, or Confessions. In his section arguing for the importance of recovering traditioned thought in The Drama of Doctrine, Kevin Vanhoozer listed a number of reasons (Biblical, traditional, philosophical, inevitable, and spiritual), but among them was the fact that it was “fashionable” (pg. 158), by which he meant supported by contemporary movements in literary theory. In other words, all the cool kids are doing it. I was reminded of this point as I opened Michael Allen and Scott Swain’s little volume Reformed Catholicity: The Promise of Retrieval for Theology and Biblical Interpretation. Part of their project is making the case for a Reformed iteration of this movement that appreciates the traditional shape of even Protestant practices like Sola Scriptura, which commonly is interpreted as precluding this sort of activity. In order to set the stage for their own project, though, they begin by compiling and briefly describing a fascinating list of recent movements in theology that have set the stage, or contributed to the revival of retrieval in theology (pp. 4-12). I thought it might be useful to briefly summarize their summary and comment on their summary list. Nouvelle Theologie. Earlier in the 20th Century a bunch of Roman Catholic theologians like De Lubac and Congar led the way in trying to reappropriate patristic and biblical theology for systematics, sacramental theology, and liturgical practice. Much of this theology set the stage for the developments of Vatican II. Karl Barth. Barth’s Church Dogmatics did many things, but one of the big long-term effects it had was reviving the discipline of dogmatics in theology, drawing heavily as it did on patristic and Reformational sources. Reception History. Plenty of Biblical scholars like working with the historical context of the text, but there’s a big movement to do work on compiling commentaries or studies on the historical reception of texts. In other words, not just asking “how ought we read it?”, but asking “how has it been read in the past?” in order answer the former. Thomas Oden’s “Paleo-Orthodoxy.” Thomas Oden’s conversion from liberal, Protestantism to a sort of “paleo-orthodoxy”, a “pastiche” of patristic and Protestant theology is an approach towards a “consensual Christianity.” He has also headed up the Ancient Christian Commentary on Scripture series in order to facilitate this sort of scholarship and spirituality as well. Robert Webber’s Ancient-Future Christianity. Webber has written various works and developed a number of ministries devoted to helping Evangelicals tap in the Christian past for the sake of engaging postmodern culture in worship and evangelism. The Modern Hymn Movement. Reformed and Presbyterian churches and ministries like RUF, Indelible Grace, and Keith and Kristyn Getty have been retooling classic hymns and developing new ones for revived congregational worship. Carl Braaten and Robert Jenson’s Evangelical Catholicism. From within the Lutheran tradition, Braaten and Jenson have been trying to focus the church on classical resources as a way forward for the ecumenical conversation and the strength of the church. To that end, they launched the Center for Catholic and Evangelical Theology, begin the journal Pro Ecclesia, and published a number of influential volumes in that vein. Allen and Swain note, though, that while Bloesch and Oden’s retrieval ends up looking like pretty standard classical theism, Jenson and others have still engaged in quite a bit of theological reconstruction, showing the retrieval doesn’t only lead to repetition. Theological Interpretation of Scripture. One big movement afoot is the drive towards “theological exegesis”, or reading Scripture to do theology and not just historical or textual criticism. To that end, a lot of theoretical ink has been spilled, but a number of good theological commentary series have begun as well. Radical Orthodoxy. The movement by theologians like Catherine Pickstock, Graham Ward, and John Milbank, to reappropriate a sort of Christian Platonism in order to combat the decline of the Church, leans heavily on the idea of retrieval, even if it has been often criticized for its idiosyncratic and problematic readings of the history it’s attempting to retrieve. Evangelical Ressourcement. Evangelicals are getting in on the fun too. D.H. Williams has been arguing for recovering the early church as a theological resource and Hans Boersma has been even more specific in advocating a particular sacramental ontology, mostly drawing on the Nouvelle Theologie of Roman Catholic theologians. The Emerging or Emergent Church(es). Whatever their problems have been, the emerging or emergent movement did have an emphasis on retrieving the various insights, texts, and practices of the Christian past to meet the postmodern future. Of course, this played out differently for various kinds of emerging or emergent churches. Ressourcement Thomism. Thomism is the gift that keeps on giving. At least, that’s what a number of recent Roman Catholic theologians like Matthew Levering, Gilles Emery, and Reinhard Hutter have been arguing. Engaging with movements in biblical studies, systematics, and philosophical movements, these theologians have been making the case that Thomas still has something to say to the modern church. As I read Allen and Swain’s list, I was fascinated to note how many of the movement and theologians had their effects on my own journey. When I was young in theology, the emergent conversation was in full swing and so the talk of appealing to tradition was definitely in the air. Thankfully reading some Pelikan and Vanhoozer showed me early that it could be done while keeping your Orthodox and Evangelical wits about you. In philosophy, MacIntyre’s work in After Virtue and Whose Justice? Which Rationality? had its effect as well. Oden and Bloesch are sitting on my shelf, duly marked up, as well as some Barth, Boersma, and Jenson. I suppose my early classes in the history of philosophy had their effect as well. It’s hard to take a whole class on Augustine’s thought and believe him irrelevant to any theological conversation. This is also largely the impulse behind my big reading projects. Beyond this personal reflection, though, a few things are worth noting about this list. First, retrieval is an ecumenical endeavor. Theologians across the major traditions, both Catholic and Protestant, are well-represented. Although, one important absence ought to be noted and that is the names of any Eastern Orthodox theologians. The burgeoning awareness of Eastern Orthodox theology has definitely spurred on the movement towards engagement with the Fathers on the part of Western theologians. Second, retrieval is not a monolith. As already noted with the case of Jenson and someone like Oden, two theologians may be committed to the project and yet their engagement may yield wildly diverging judgments on something like the doctrine of God. What’s more, since it is an ecumenical endeavor with a catholic spirit, it will inevitably bear diverse fruits as theologians approach the catholic tradition from within their own ecclesiastic locations. Third, and connected to the second, retrieval theology need not yield theological sterility. Some of the most creative theological minds of the 20th Century are included in that brief summary. Indeed, when think of some of the work being done in the Theological Interpretation of Scripture, some of the brightest of our own very young century are those looking back to the wisdom of yesteryear through figural and typological readings. Many have ended up breaking the modern, interpretive mold in the process. Finally, retrieval can be quite practical. Indeed, most of the movements and theologians mentioned are quite heavily involved with the cause of church renewal within their respective communions. Looking to the past is not simply done for the sake of dry antiquarianism, but for the life of the Church in the world today. In other words, it’s not only done to preserve the memory of the victories of church triumphant, but for the battles the church militant is currently embroiled in. Now the question is, what exactly will Allen and Swain contribute to the discussion? I suppose I’ll just have to keep reading to find out. I’d suggest that many of you consider doing the same. You can purchase the book here. You’ve repeated a paragraph twice. The one that begins: “Beyond this personal reflection…”. Might need to edit that! Thanks! I have a correction software that often does that sort of thing without my notice. Knowing what people have said in the past is fine to me, but using this as a basis for ecumenism sounds awful. Ecumenism is not needed, but contradiction.